Reading Transport Fleet List: In the event 822 went on loan to Weavaway rather than 824, and was in service along with 599, 823, 1002/3/5 today. Thanks to David Wilder for this. Stagecoach in Oxfordshire Fleet List: Volvo B9R / Caetano Levante FJ60 HYV has arrived on loan from South Gloucestershire Bus & Coach to cover for repair work on the Plaxton Elite fleet. Meanwhile demonstrator SN59 AWX entered service this afternoon. Stagecoach in Warwickshire Fleet List: 54061 arrived from Wales on 25th. Thanks to Simon Nicholas for this. 16492 has arrived at Rugby from Chesterfield, and was expected to move to Leamington today. 32615 has route 4 branding. 20214 has returned to Rugby from reserve at Leamington, whilst withdrawn Stratford 16079 has also arrived at Rugby pending scrapping. Thanks to Steve Buckley for this. Reading Transport Fleet List: 599, 823/4 and 1001 were expected to go on loan to Weavaway today to operate the whole of route 1 from tomorrow, with 1001 being based at Reading as spare for any issues at the Reading end of the route. All are expected to return on 1st April. Thanks to Derek Bradfield for this. 974 is seeing occasional use at Newbury. Thanks to David Wilder for this. 1001-6 have been advertised for sale, available 2nd April. First Berkshire Fleet List: Bracknell 43833-5 have been withdrawn and transferred to Scotland, 43833 on 5th and 43834/5 on 10th. Thanks to Mat Wooll for this. 41257 is set to follow following service changes from 31st. 64791/2/3/4/8 have been returned to their original registrations and withdrawn from First Capital. Thanks to Brian Coney for this. 43833-5's recent time at Slough appears to have been in preparation for the move. Weavaway Travel Fleet List: Loaned RX07 RKV is in use on routes 101/4/5 rather than Vitality 1. Thanks to David Wilder for this. Stagecoach in Oxfordshire Fleet List: 15440 has lost its route S5 branding to allow its use on route S3 following the arrival of 19659. 22279 has lost its MegaRear for the Blackbird Leys Centre following a partial repaint, completing the de-branding of the buses used on route 1 prior to the arrival of the hybrids. Some of the National Express coaches have new MegaRears for Save 30%. Stagecoach in Warwickshire Fleet List: 34628 has been repainted out of route 48 livery and re-entered service at Nuneaton. Rugby 31047 has been withdrawn. Thanks to Keith Wood for this. Reading Transport Fleet List: 729 departed for Norfolk Green on 11th. 821 returned from repaint into generic silver on 17th and 820 today. 821 returned to service on 19th. Wright Streetlite BRZ 9662 returned to Wrightbus today and Optare Solo YN59 GGO to Optare on 9th. Thanks to Brian Coney for this. Burghfield Mini Coaches Fleet List: R213 ENY, R798 DMB and V748 KEU were scrapped in December. Thanks to Derek Bradfield for this. Reading & Wokingham Coaches Fleet List: X7 FFC has been advertised for sale. Thanks to Derek Bradfield for this. Weavaway Travel Fleet List: Former YJ51 EKK passed from Plaxton (dealer) to Stephensons, Easingwold in November. Thanks to Derek Bradfield for this. White Bus Service Fleet List: Former V917 TAV has passed from Vale (dealer) to Newton, Normandy. This and R714 KGK were part exchanged with Plaxton (dealer), but passed directly to Vale (dealer). Thanks to Derek Bradfield for this. Reading Transport Fleet List: 110 is back in service at Newbury. Thanks to David Wilder for this. New Vauxhall Combo van RO60 WVX replaces 353 and is in white with Reading Buses logos. 51/2 are to be replaced by 1029/30 in March following repaint and refurbishment. First Berkshire Fleet List: 42343 has received a new ColourBus livery for Lakes, replacing the one for Street Safety. Meanwhile 42341 has lost its ColourBus livery for Lakes in favour of fleet livery. Thanks to David Fuller for this. 20201 returned to London on 9th December rather than 29th November as previously reported. 32348 entered service on 19th. Thanks to Mat Wooll for this. Stagecoach in Oxfordshire Fleet List: Alexander Dennis Enviro 400 demonstrator SN59 AWX arrived at Oxford on 18th to cover warranty work on the Scania / Enviro 400s. Stagecoach in Warwickshire Fleet List: New arrivals at Leamington are Volvo Olympians 16483/94 from Chesterfield. Thanks to Keith Wood for this. 33323 has arrived at Rugby on loan from reserve at Northampton. Thanks to Tim Brown for this. Reading Transport Fleet List: 711 has been on loan to The Green Bus, Birmingham since around 4th. Reading Transport Fleet List: 117 temporarily remains available at Newbury as a spare vehicle along with 974. Thanks to David Wilder for this. Reading Transport Fleet List: 117 has also been withdrawn from Newbury for disposal, and also has the new MegaRear for Matalan. White Bus Service Fleet List: New from Reays, Wigton on 13th were Volvo B7R / Plaxton Profile YN10 ABK/O to replace R714 KGK and V917 TAV which passed to Bob Vale (dealer) the same day. Thanks to Mac Head for this. Stagecoach in Oxfordshire Fleet List: 33822 returned from Banbury to Oxford reserve on 13th. Thanks to Martin Townsend for this. Stagecoach in Warwickshire Fleet List: New for Rugby are Alexander Dennis Enviro 200s 36207-20 which have now been delivered and are likely to enter service on routes 4 and 86 shortly. Leamington 33353/4 have gone into reserve, whilst 35174 has returned to Nuneaton from Northampton. Reading Transport Fleet List: 501 has gone on loan to Weavaway Travel for use on Vitality 1. 823/4 appear likely to follow with the remaining 50% of the service 24 January along with one other rather than four Solars. Thanks to Derek Bradfield for this. Stagecoach in Oxfordshire Fleet List: Oxford reserve 33822 transferred to Banbury reserve on 6th, and Banbury reserve 31361/2/5 departed for their new owner on 8th as planned. Thanks to Martin Townsend for this. Stagecoach in Warwickshire Fleet List: Stratford 16085 is now confirmed back in service. Thanks to Martin Townsend for this. Reading Transport Fleet List: 728 arrived at Norfolk Green today. 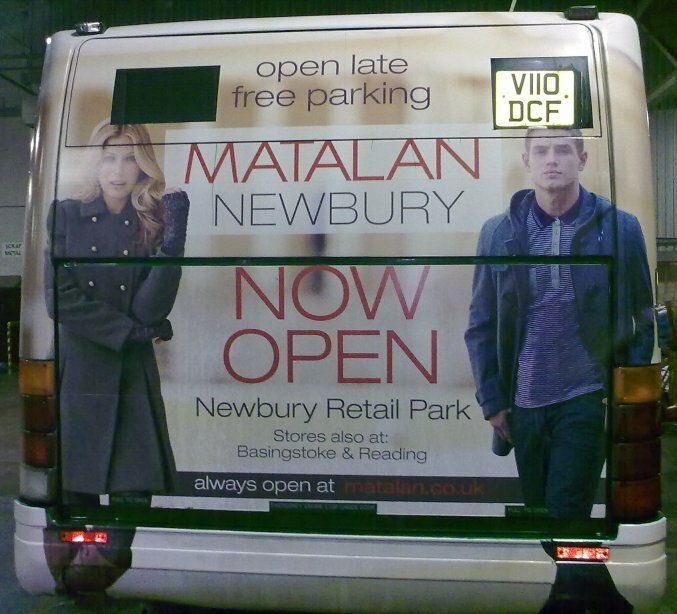 110 has been withdrawn from Newbury for disposal, but also has a new MegaRear for Matalan. 501 has lost its branding for the Link, but retains its MegaRear for the service. It returned to service at Reading on 29th and 30th on rail replacement duties, but is again now withdrawn for sale. 821 is being prepared for repaint from pink into silver, to be followed by 820. 51/2 will also be withdrawn soon, but will be replaced by 1029/30 from Reading which will be repainted red. 1031 is then due to be repainted into generic silver, meanwhile is acting as spare for Green Park, TVP and Vitality 1 as it is fitted with WiFi and also one of the new ticket machines which are only used on these routes so far. 825 had GPS and WiFi fitted last September for use on The Green Bus routes to Theale Green School and route 26. Reading Transport Former Vehicle Fleet List: The Wright Streetlite demonstrator BRZ 9662 remains at Reading out of use pending minor repairs before return to Wrightbus. Mortons Travel Fleet List: WA09 AZB is a Bova Futura FLD and WA10 CFN is a Bova Futura FLI. Thanks to Adrian Morton for this. Stagecoach in Oxfordshire Fleet List: 33821 went on loan to Banbury from reserve at Oxford on 5th. Similar 33822 is expected to transfer from reserve at Oxford to reserve at Banbury later this week, with 33821 to return to reserve at Oxford. Thanks to Martin Townsend for this. Banbury reserve 31361/2/5 have been sold, and are to depart on Saturday. Stagecoach in Warwickshire Fleet List: Leamington 20227 is on loan to Stratford. 16617/8 and 17054/9 have received new Unibus branding on their red livery, 17054 is still however being repaired. 16514-7 are rumoured to be due for replacement shortly. Thanks to Keith Wood for this. Reading Transport Fleet List: Optare Solo SR demonstrator YJ59 GGO arrived on 23rd December, and has been in use at Newbury. It is expected to see use in Reading on route 142 this week before returning to Optare on 9th. 728/9 have been sold to Norfolk Green and are due to depart early this month. Scania OmniDekkas 823/4 have nominally been allocated to Vitality 1 to ease capacity issues on certain journeys - it is not clear which vehicles will now go on loan to Weavaway when operation of the final 50% of the service transfers there later this month. Thanks to Brian Coney for this. Reading Transport Dennis Dart SLFs: Former 604 has been reregistered BU51 TOY. Thanks to Brian Coney for this. First Berkshire Fleet List: 43835 transferred from Bracknell to Slough in November, followed by 43833/4 in December, 43833 having already been there on loan. 32348 has now entered service at Bracknell. 20201 returned to Dagenham off loan on 29th November. Thanks to Brian Coney for this. Stewarts of Mortimer Fleet List: The new Plaxton Elite has yet to arrive, but is expected shortly. YN09 AOL is named Glyn & Boys and YN09 AOK is named Mark & Fi, whilst YN60 DXK is named Daniel not Derek as previously reported. Thanks to Alan Cummings for this. Stagecoach in Oxfordshire Fleet List: 19659 entered service on 26th December, and 33821 returned to reserve. 15440 is to loose its branding for route S5 soon and gain Wi-Fi. 44363 and 47456-9 transferred to Wales as planned on 18/19 December. 50214 returned to service on 31st December following repairs, meanwhile 50226 is off the road following an accident on 10th December. News Page: Caversham Road Bridge Replacement - click here to go to the special report on rail replacement operations. Thanks to Richard Mallett for a photo of the new bridge on-site yesterday morning. Mortons Travel Fleet List: On order for March/April are two new Bova Futuras to replace YJ06 LFB and YJ57 BTE. G17 BUS has been sold to Quantock Motor Services, and will make it's final appearance in service tomorrow before heading off for repaint. A recent new addition is Volvo Citybus / Northern Counties G637 BPH from Worth's Coaches. Thanks to Adrian Morton for this. Reading & Wokingham Coaches Fleet List: New in October was Toyota Coaster FJ60 EGX. Similar BX56 AYF departed in November. Thanks to Derek Bradfield for this. Stewarts of Mortimer Fleet List: Subsequent disposals for YN55 YRW/Y added. YN05 UCK corrected to YN05 UVK. Thanks to Derek Bradfield for this. Weavaway Travel Fleet List: Renault Traffic RA56 GYT departed in November. Thanks to Derek Bradfield for this. New is Renault Traffic YK60 UZU in black with Weavaway lettering. White Bus Service Fleet List: GHV 983N corrected to GNV 983N, and acquisition month of November added. Acquisition month of March added to ODL 632R. Thanks to Derek Bradfield for this.